A drought is defined as "a period of abnormally dry weather sufficiently prolonged for the lack of water to cause serious hydrologic imbalance in the affected area." -Glossary of Meteorology (1959). In easier to understand terms, a drought is a period of unusually persistent dry weather that persists long enough to cause serious problems such as crop damage and/or water supply shortages. The severity of the drought depends upon the degree of moisture deficiency, the duration, and the size of the affected area. There are actually four different ways that drought can be defined. Meteorological-a measure of departure of precipitation from normal. Due to climatic differences, what might be considered a drought in one location of the country may not be a drought in another location. Agricultural-refers to a situation where the amount of moisture in the soil no longer meets the needs of a particular crop. This condition can arise, even in times of average precipitation, owing to soil conditions or agricultural techniques. Hydrological-is brought about when the water reserves available in sources such as aquifers, lakes, and reservoirs falls below the statistical average. This condition can arise, even in times of average (or above average) precipitation, when increased usage of water diminishes the reserves. Socioeconomic-refers to the situation that occurs when physical water shortages begin to affect people. While much of the weather that we experience is brief and short-lived, drought is a more gradual phenomenon, slowly taking hold of an area and tightening its grip with time. In severe cases, drought can last for many years, and can have devastating effects on agriculture and water supplies. Climate change has also provoked more frequent and intense droughts in sub-tropical areas of Asia and Africa, exacerbating shortages in some of the world's poorest countries. According to a UN climate report, the Himalayan glaciers that are the sources of Asia's biggest rivers - Ganges, Indus, Brahmaputra, Yangtze, Mekong, Salween and Yellow - could disappear by 2035 as temperatures rise. While the world's population tripled in the 20th century, the use of renewable water resources has grown six-fold. 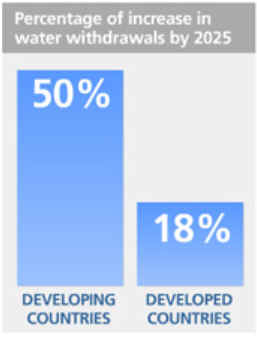 Within the next fifty years, the world population will increase by another 40 to 50 %. This population growth - coupled with industrialization and urbanization - will result in an increasing demand for water and will have serious consequences on the environment. The total volume of water on Earth is about 1.4 billion km3. 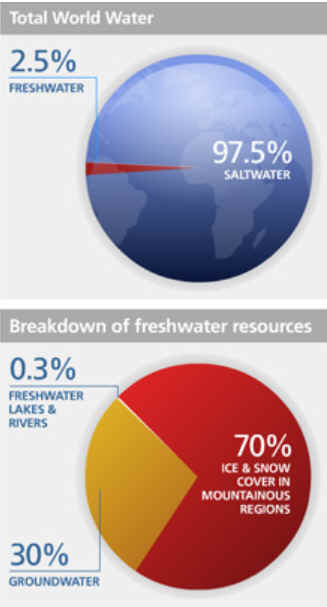 The volume of freshwater resources is around 35 million km3, or about 2.5 percent of the total volume. Of these freshwater resources, about 24 million km3 or 70 percent is in the form of ice and permanent snow cover in mountainous regions, the Antarctic and Arctic regions. Around 30 percent of the world's freshwater is stored underground in the form of groundwater (shallow and deep groundwater basins up to 2 000 metres, soil moisture, swamp water and permafrost). This constitutes about 97 percent of all the freshwater that is potentially available for human use. Freshwater lakes and rivers contain an estimated 105 000 km3 or around 0.3 percent of the world's freshwater. The Earth's atmosphere contains approximately 13,000 km3 of water. The total usable freshwater supply for ecosystems and humans is about 200 000 km3 of water - less than 1 percent of all freshwater resources. 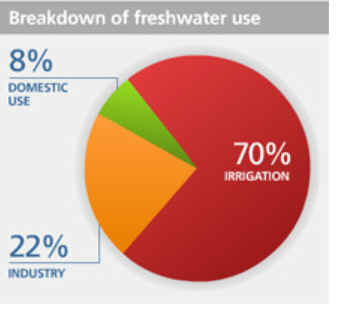 Water use has been growing at more than the rate twice of population increase in the last century. 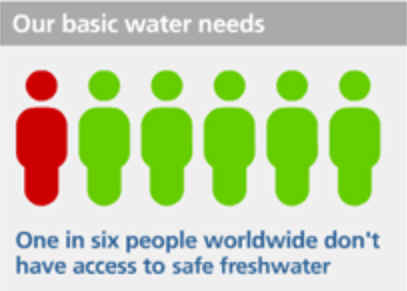 The world's six billion people are appropriating 54 percent of all the accessible freshwater contained in rivers, lakes and underground aquifers. 145 nations have territory within a transboundary basin. Water withdrawals are predicted to increase by 50 percent by 2025 in developing countries, and 18 per cent in developed countries. Over 1.4 billion people currently live in river basins where the use of water exceeds minimum recharge levels, leading to the desiccation of rivers and depletion of groundwater. In 60 percent of European cities with more than 100,000 people, groundwater is being used at a faster rate than it can be replenished. By 2025, 1.8 billion people will be living in countries or regions with absolute water scarcity, and two-thirds of the world population could be under stress conditions. 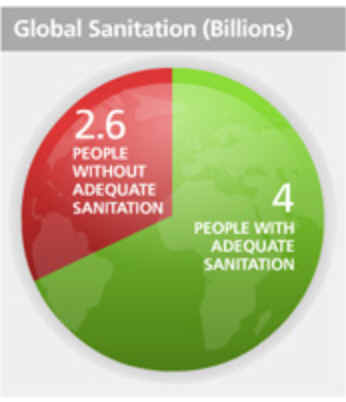 Today 2.5 billion people, including almost one billion children, live without even basic sanitation. Every 20 seconds, a child dies as a result of poor sanitation. That's 1.5 million preventable deaths each year. In Sub-Saharan Africa, treating diarrhoea consumes 12 percent of the health budget. On a typical day, more than half the hospital beds in are occupied by patients suffering from faecal-related disease. Washing hands with soap can reduce the risk of diarrhoeal diseases by up to 47 per cent. 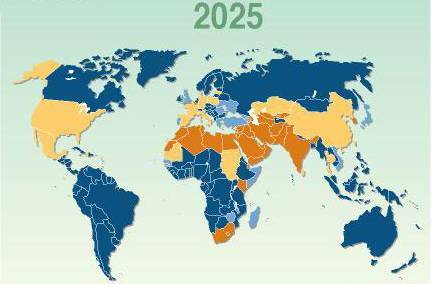 By 2025, 1.8 billion people will live in countries or regions with absolute water scarcity. 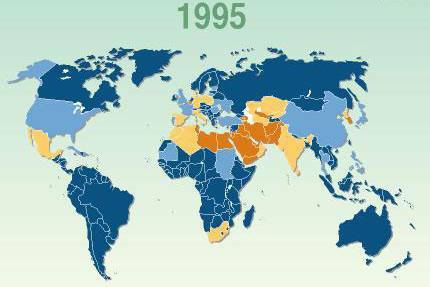 Most countries in the Middle East and North Africa can be classified as having absolute water scarcity today. By 2025, these countries will be joined by Pakistan, South Africa, and large parts of India and China. This means that they will not have sufficient water resources to maintain their current level of per capita food production from irrigated agriculture—even at high levels of irrigation efficiency—and also to meet reasonable water needs for domestic, industrial, and environmental purposes. 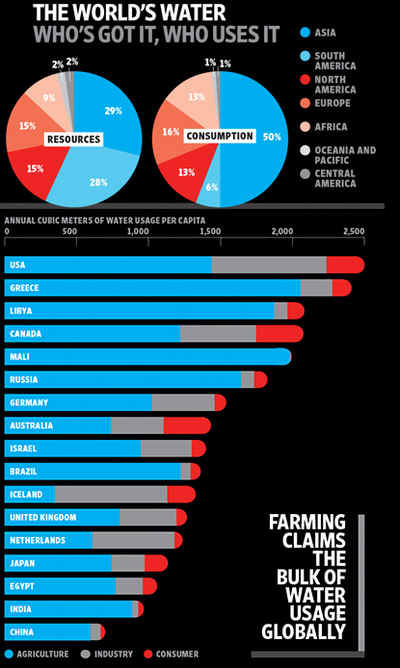 To sustain their needs, water will have to be transferred out of agriculture into other sectors, making these countries or regions increasingly dependent on imported food.